Gondolier "Gio" and I were approaching each other from both sides of the Newport Blvd. Bridge. I took a whole bunch of shots, and in all honesty, this is one of the only ones that came out. 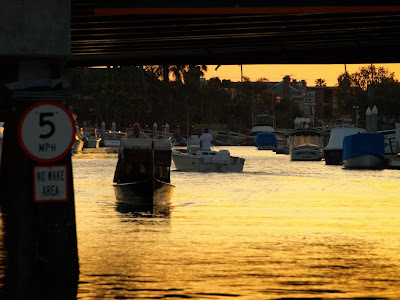 But I like it - it captures many elements of our world here in Newport: the sunset, the bridges, the boat traffic, and of course - the 5mph "no wake" signs which nobody pays much attention to.